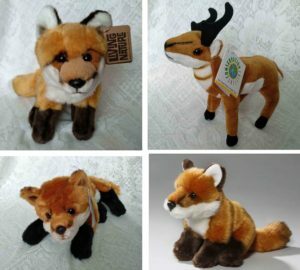 Hurriyah, the injured fox that Caylin and Reema find in the back garden of their block of flats, speaks in verse. She calls vehicles ‘monsters’, people ‘two-legged beasts’, houses ‘beast-boxes’ and the shed they are hiding behind the small box’. If you could write a poem from the point of view of an animal, what animal would it be, and how would it talk? What interesting words would it use, and how would it see the world? 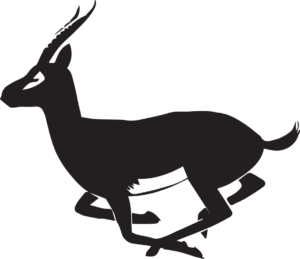 Write a poem from the point of view of this animal, and see if other people in your class can guess which animal it is from the way it talks. 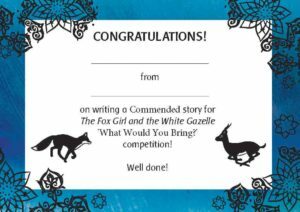 Then send it to me for judging along with a silhouette drawing of your animal like the ones on the cover of The Fox Girl and the White Gazelle! The Competition is open to all pupils in Primary 4, Primary 5, Primary 6 and Primary 7, or Year 4, Year 5 and Year 6. The top twenty entries will each win printed copy of the collected poems in booklet form and a certificate. Twenty runners up will receive a certificate and fox pencil. Closing date for entries is Monday 1st April 2019. Reema’s favourite item that she brought with her from Syria is the sea-green headscarf her brother bought for her birthday. 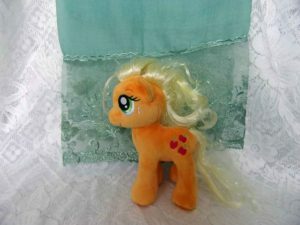 Caylin also has a special item – the Applejack My Little Pony that reminds her of her grandad who gave it to her. If you had to go and live in another country and could only bring one item with you, what would it be? 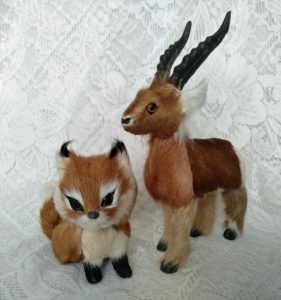 Do you have a special item that means a lot to you? Tell me about it – what it is, whether you bought it yourself, if it was passed down to you, or someone else gave it to you. Why is it special? The closing date is Friday 7th December 2018. Click HERE TO SEE A GALLERY displaying all of the brilliant entries. 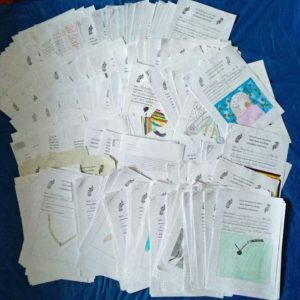 Well done to everyone who took part! Just some of the many entries! The finished Top Trump cards! 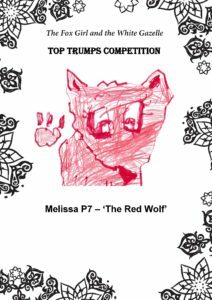 Well done to the hundreds of P4-P7 pupils who entered the Top Trumps Competition. 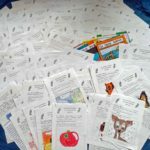 Have a look at all of their great work below. It was very hard choosing the best stories as there were so many imaginative entries! 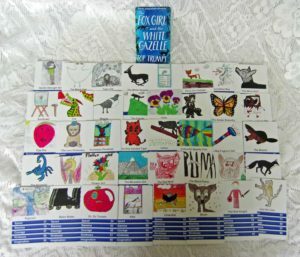 The winning ten entries and twenty-seven runners up who wrote the best stories had their character pictures used to design a pack of official ‘The Fox Girl and the White Gazelle’ Top Trumps cards. 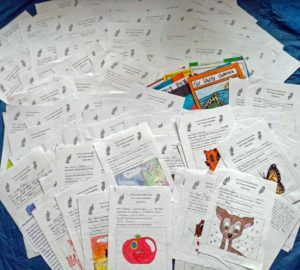 Each of the ten winners received a pack of these cards and a certificate, while the runners up received their own card and a certificate. 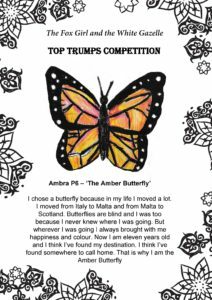 Well done to everyone who entered the competition for your hard work! 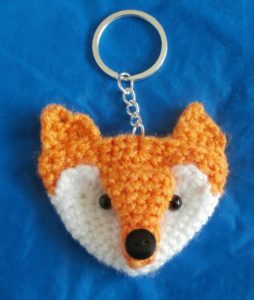 Click HERE TO SEE A GALLERY showing some of your great entries, well done to everyone for taking part! 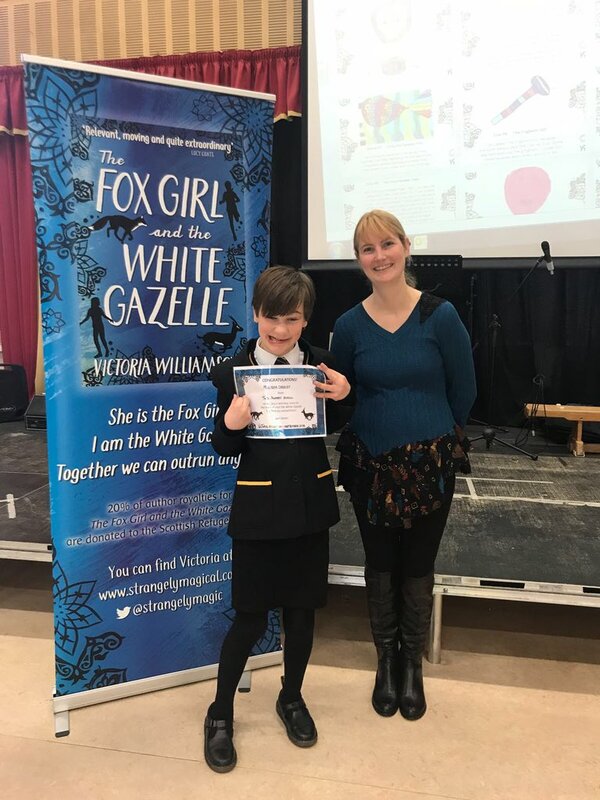 To celebrate the launch of the Fox Girl and the White Gazelle, I’m running a Top Trumps card competition for pupils in P5, P6 and P7. 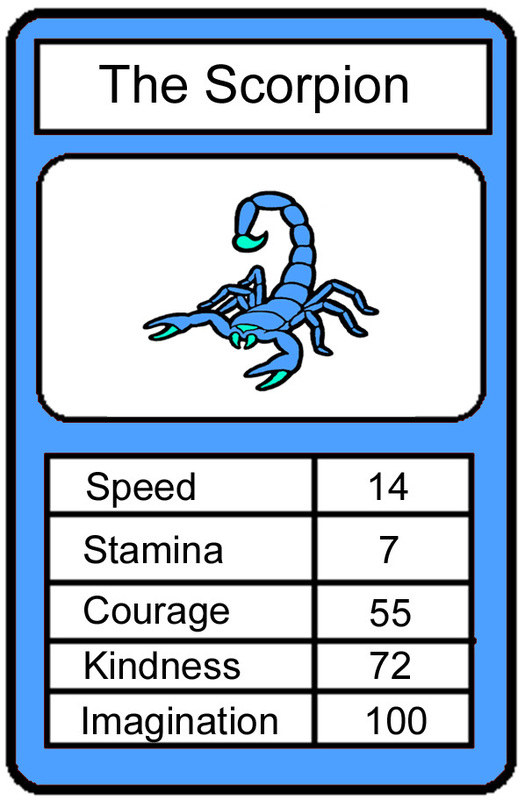 When it comes to running, Caylin is slightly faster, which is why she has the top speed of 100, but Reema can keep running for longer, so she has the top score for stamina. I’m hopeless at running, but as an author I’d like to think I’ve got a good imagination, so I’ve given myself the top score for this! 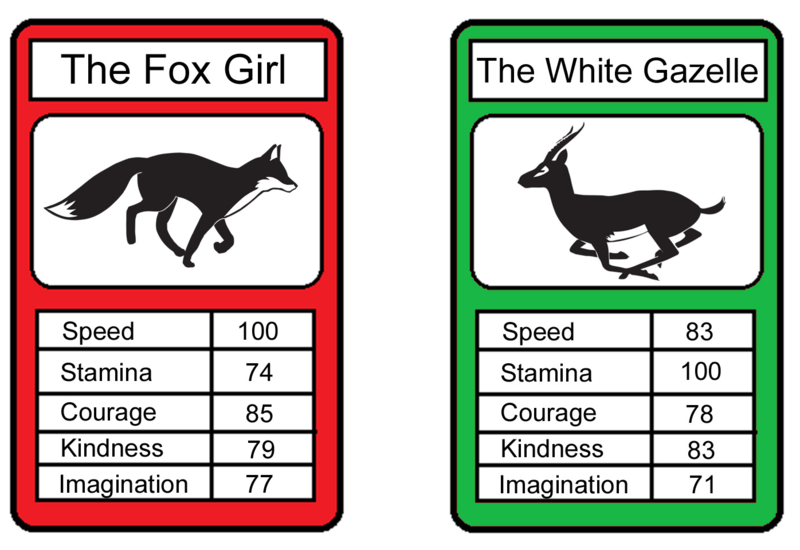 If you’d like to enter the competition to design your own Top Trumps card and win the chance to see it printed up for our official #FoxandGazelle Top Trumps card pack, download the rules and entry form below and enter today! The competition is open to all Primary 5, Primary 6 and Primary 7 pupils in UK schools, and the closing date for entries is Tuesday 10th July 2018.